Marathon #23, complete. 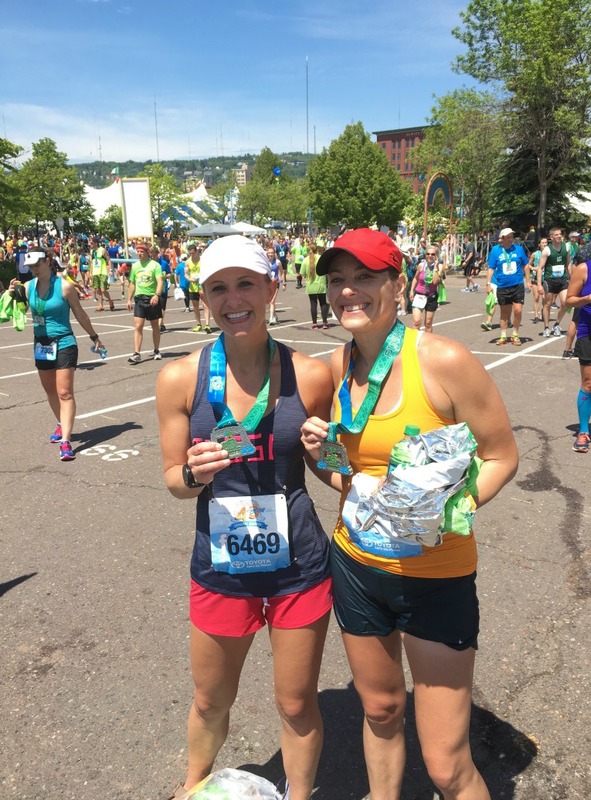 On Saturday, June 18, 2016, I ran Grandma’s Marathon in Duluth, MN. This was my second Grandma’s Marathon. Other than Twin Cities, this is the only marathon I have done more than once. 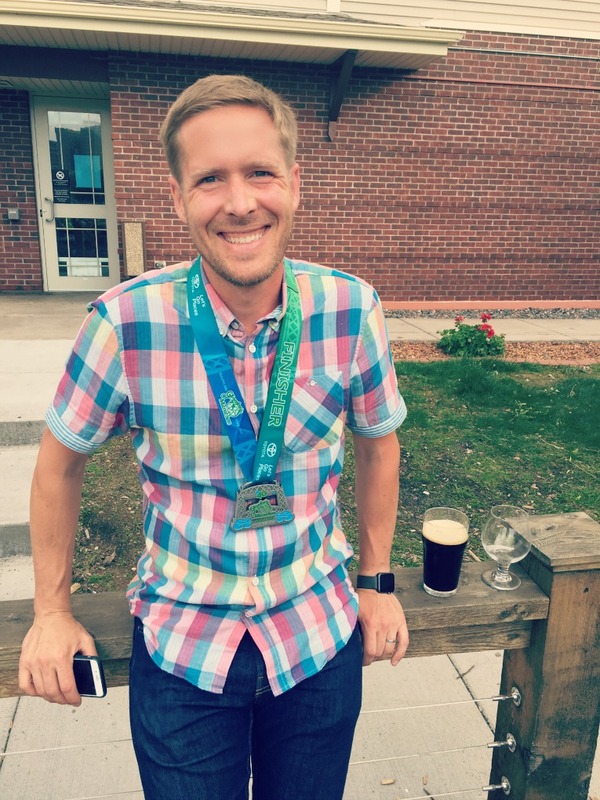 I’m going to start with the bad news…I did not achieve my goal at this race; I had hoped to go under 3:40 by enough to be able to register for Boston 2017 with Dustin. But Mother Nature had other plans. I ran a 3:49:20. Basically, I ran the exact same time that I ran eight weeks ago at the London Marathon. …but don’t worry! I still had a blast and my love of the marathon is still just as strong. I am thankful to the volunteers at the race and to all the support of my friends and family. The marathon is HUNDREDS of miles; the finish line is 26.2 miles. My finish line didn’t go quite as I had hoped, but the marathon (i.e. the training, etc) were amazing. 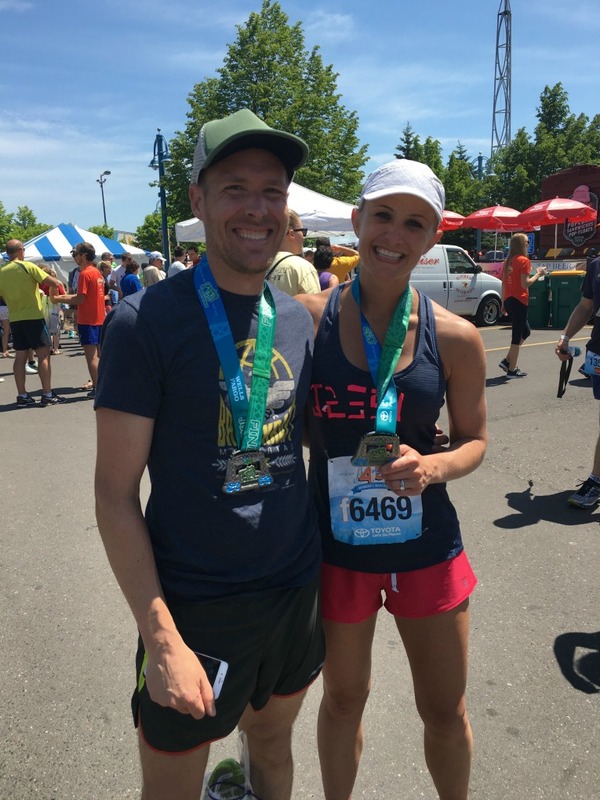 With marathons, there are some things you can control. You can control your training, your diet, your rest, your strength training, but you can’t control the weather, and unfortunately, the weather was not on my side on Saturday. Throughout the race, the “weather warning” flags went from yellow (moderate risk) to red (high risk) to BLACK by the time I finished (extreme). It was a rough day out there for most everyone. This was the Grandma’s Marathon experience that everyone had warned me about. Last year’s magic was gone and replaced by a bit of a death march to the finish. Backing up a bit- I started Friday with a quick shake-out run with my morning running girls. It was our last run with our friend Julie, who is moving to Michigan. We’ll miss her! After a shower and breakfast, Dustin and I packed up the car and hit the road around 9:30 am. Traffic getting to Duluth was pretty terrible, but we were at the expo by 12:30 pm. It was a quick in-and-out at the expo. 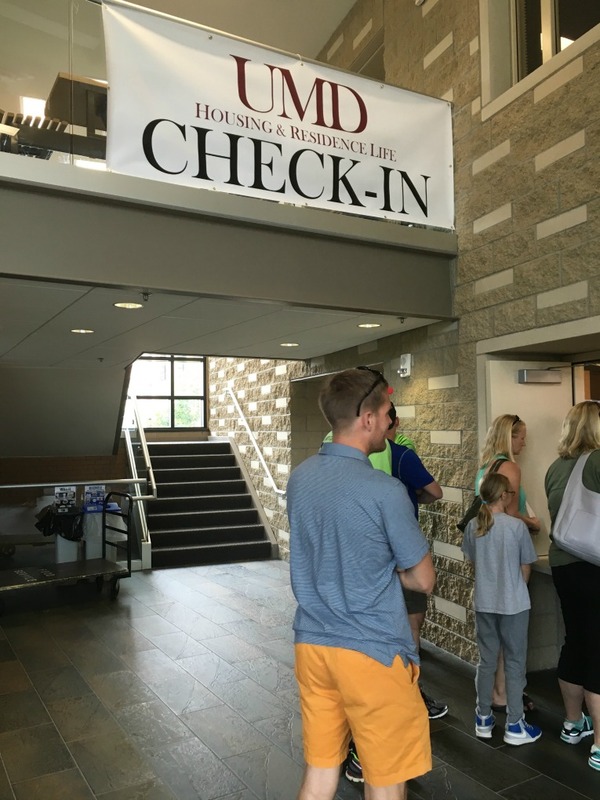 We grabbed lunch at Subway and then headed to the University of Minnesota- Duluth apartments where we stayed for the weekend. The apartment worked out well as it had a kitchen for us to cook our pre-race meal. It wasn’t air-conditioned though, which was a little sticky on a hot weekend. Another plus of the university apartments was the ease of catching a shuttle bus to the starting line. 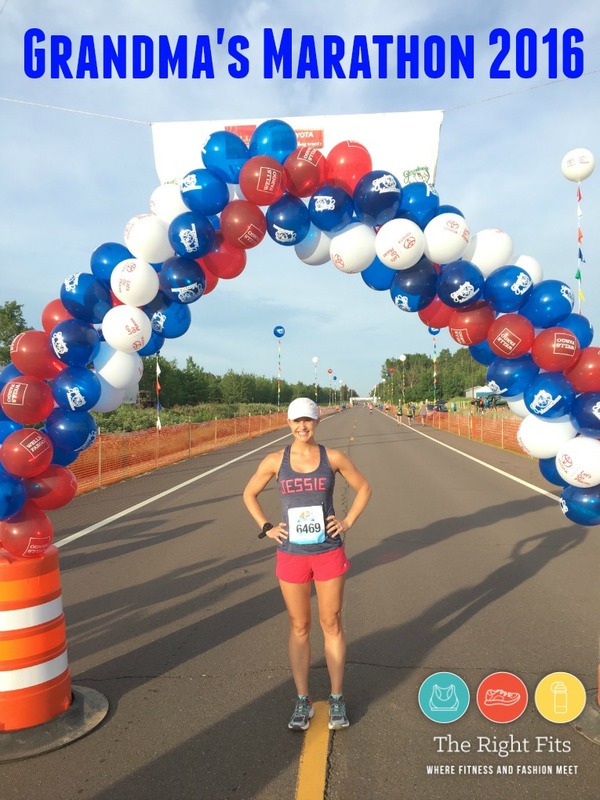 Grandma’s is a point-to-point course from Two Harbors, MN to Duluth. The shuttles started running at 5:45 am; our alarm went off around 5 am. 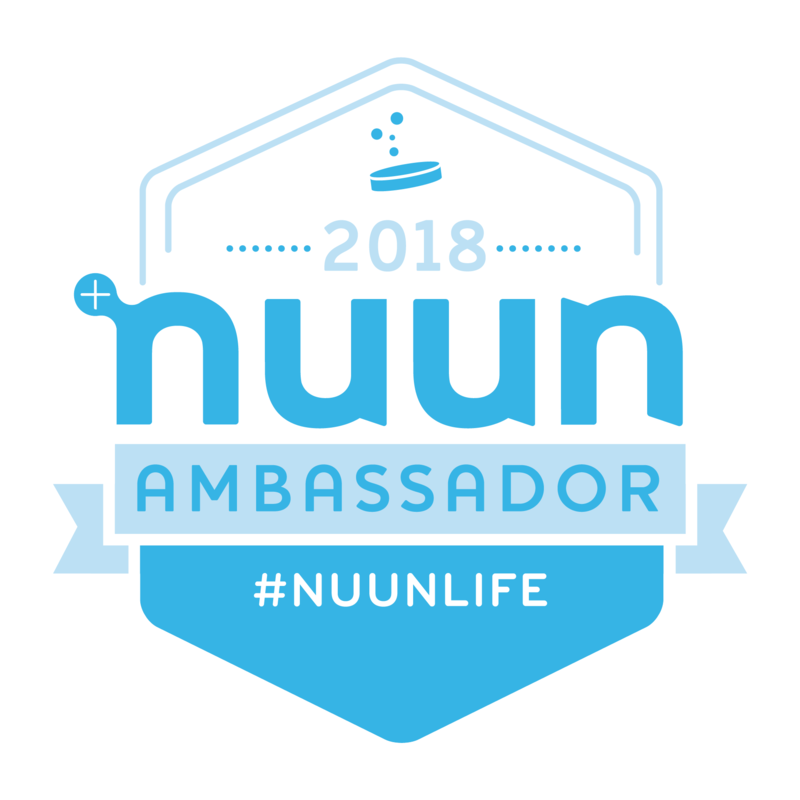 Fuel: I ate a bagel with peanut butter and extra salt, a Gen-U-Can mixed with Nuun, as well as more water and some Gatorade. I put extra effort into hydration, since by that time I knew it was going to be warm. Start Line: There were plenty of porta-potties at the start, but I did get a little stressed out because I hopped in the line too close to the start time of 7:45. I was still waiting in line during the National Anthem and finally joined the starting corrals around 7:40…so stressful! Fortunately, I was still able to make my way up to the 3:35 pacer. Promptly at 7:45 am, the starting gun went off. It took me about 2-3 minutes to cross the actual start mat. The first half of the race is pretty quiet. There aren’t a lot of spectators. But you’re surrounded by a great group of runners and beautiful Northwoods scenery. We had similar goals and were both hopeful at this time that the weather wouldn’t become a factor. We chatted for awhile and it was great to see her, but we both agreed that we were running our own races and eventually we drifted apart. 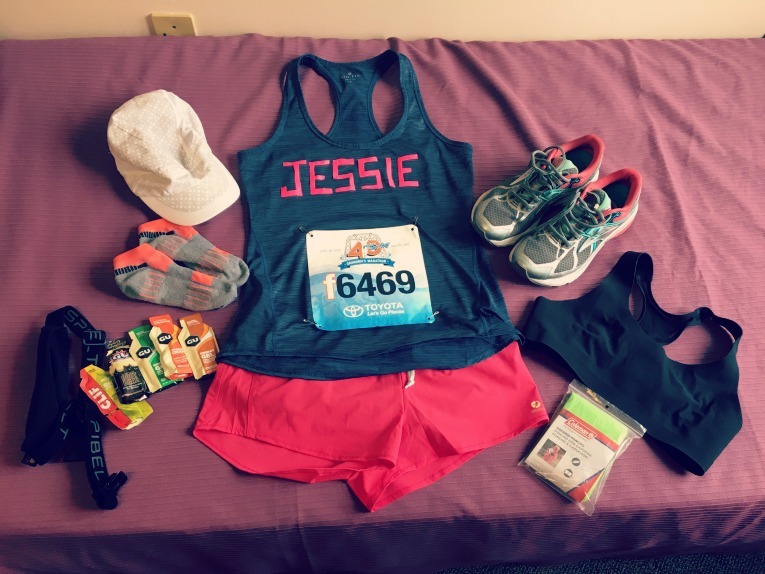 I met a friendly Oiselle runner who reads the blog. She was in town from Iowa for the race. I don’t remember her name, but I hope she hit her goal! At random spots along the way, there would be large groups of spectators, whose energy really revived me. The spectators might not have been able to line the whole course, but when they were able to be there, they were super enthusiastic. There was a moment around mile 8 that I took the time to notice how beautiful Lake Superior looked. Gorgeous. I also tried to breathe in that fresh air. It really is a beautiful part of Minnesota. Only problem is that there is no shade. Since the forecast had still called for overcast rainy skies, I didn’t use sunblock and man, oh, man was I sunburned after this race! 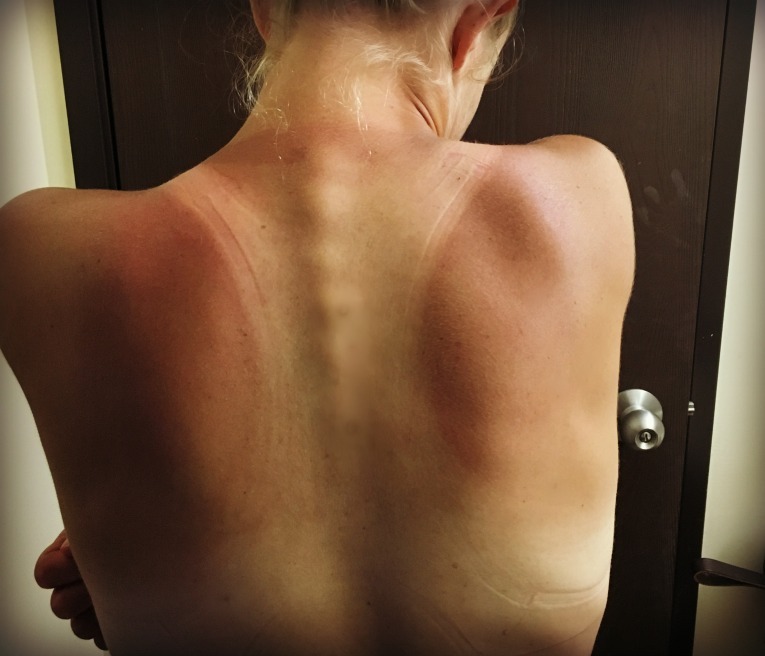 It will take awhile to get rid of these sports bra tan lines. 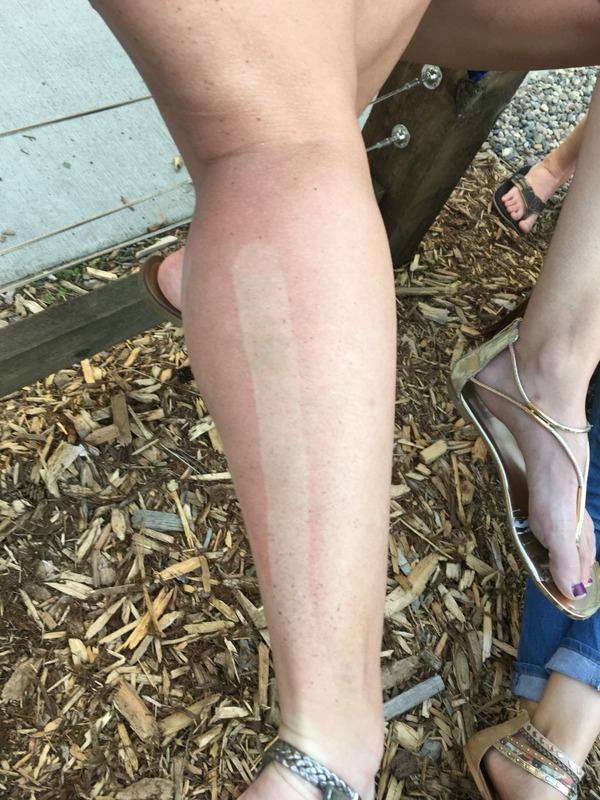 My friend Christie had an awesome tan from her Rock Tape- impressive! I came up upon two of my run club friends. I hung behind them for awhile, hoping that they would ‘hold me back’, as I knew I didn’t want to go too fast on such a hot day. They kept me honest, so to speak, for a few miles. We clocked off a few more conservative miles. Eventually I passed them during a water stop (though they ended up finishing very close to me). And then the wheels fell off, so to speak; the heat was too much for this girl. I had hit the halfway point at 1:49 and thought I might still have a chance at a PR if I could hold things together. But the heat…it was really getting to me. I could not cool down. The race organizers did a phenomenal job trying to counteract the heat though. There were PLENTY of support stops and they all had ice, cold sponges, water, Gatorade, etc. There was plenty of water for pouring on your head as well as drinking. I would put ice cubes down my bra and in my hat at every stop. I did my best to try to stay cool, but it was too hot for me. I held it together better than I expected, but it wasn’t my day. 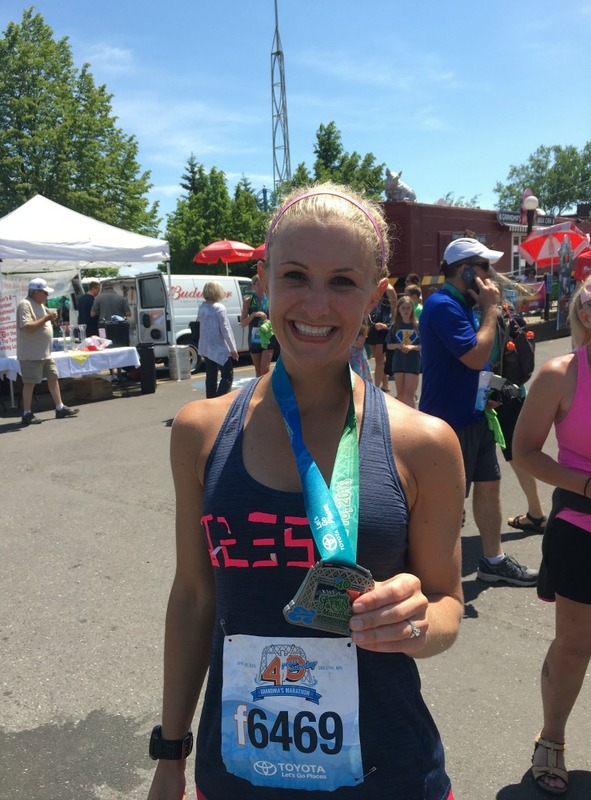 After I realized that my BQ goal was not going to happen, I focused on enjoying the race. Sure, my pace had slowed quite a bit and yes, it was so, so hot, but it was still fun! It was still a LOVELY marathon and I LOVE the marathon. I smiled at all the spectators and thanked them when they cheered for me by name. By that time, I had poured so much water over myself that my name stickers had started to fall off. Apparently whatever was left looked like JESSEF? Or JOSEF? People started looking at me and cheering for Joseph and I was confused. I took off the messed up E and turned it in to JESSI the best I could. That seemed to work. Once you came into the town of Duluth, the streets were lined with awesome spectators. I just love this part of the race. It was a blast. Eight weeks ago, I ran a 3:49:19 at the London Marathon. How easy that race felt..and how much harder this race felt! The heat and humidity are a beast. No chafing at all with this running kit, which is pretty remarkable considering the heat. I wore this Athleta Chi tank, Oiselle Mac Roga shorts, the Bitty Bracer bra from lululemon, Fitsox, this lole hat, Brooks Ravennas, and a Spi-belt for my GU’s. 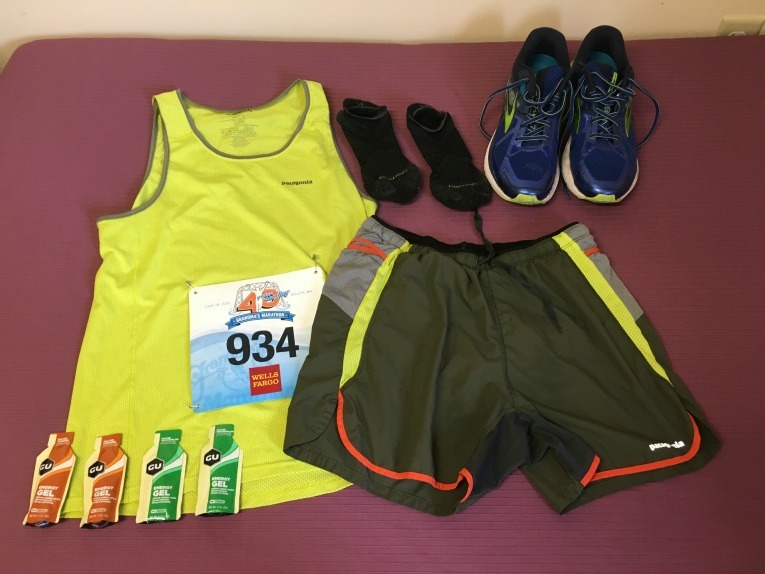 This is Dustin’s ‘fitness fashion’ for the race: Patagonia Pro-Strider shorts, Patagonia singlet, Brooks Ravennas, and Patagonia socks. At the finish line, there was chocolate milk (so good! ), cold orange juice (I downed a couple of cups!) more water, Gatorade, peanut butter sandwiches, yogurt, oranges, salted nut rolls, apples, and so much more. It was quite the spread. It took me a while to be ready for a celebratory drink of the alcoholic variety. We took the shuttle bus back to the campus, showered, lounged for a bit, and then eventually made our way to At Sarah’s Table right by the U of M where I had a glass of wine and a big sandwich. After lunch, we went back to the apartment for awhile to nap a bit before eventually making it to the Canal Park Brewery for dinner with our run club friends. 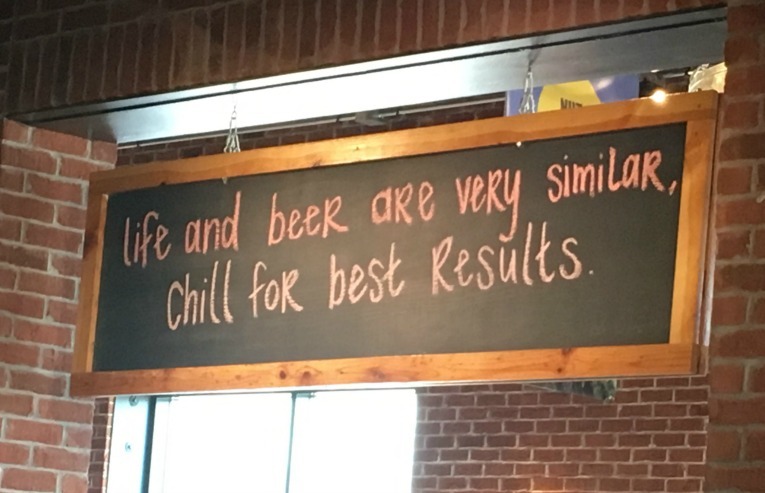 The Canal Park Brewery had this sign, which definitely hit home. I can’t get too bummed about this marathon. There will be more. By the way, look at the size of these medals! This was the 40th running of Grandma’s, so they went all out with the lift-bridge themed medals. The joke this weekend was that Dustin was a bad-luck charm for Grandma’s. He last ran this marathon in 2005 and the weather was terrible. It had been better for quite a few years, but then this year it was crap again. Thanks a lot Dustin! I’m not sure. My coach is sending me a list of “Last-Chance BQ” races in early September. There is one that is close to my parent’s house in Kalamazoo, Michigan, so I am considering it. It sounds kind of hilarious- 6 loops of an approximately 4 mile loop. 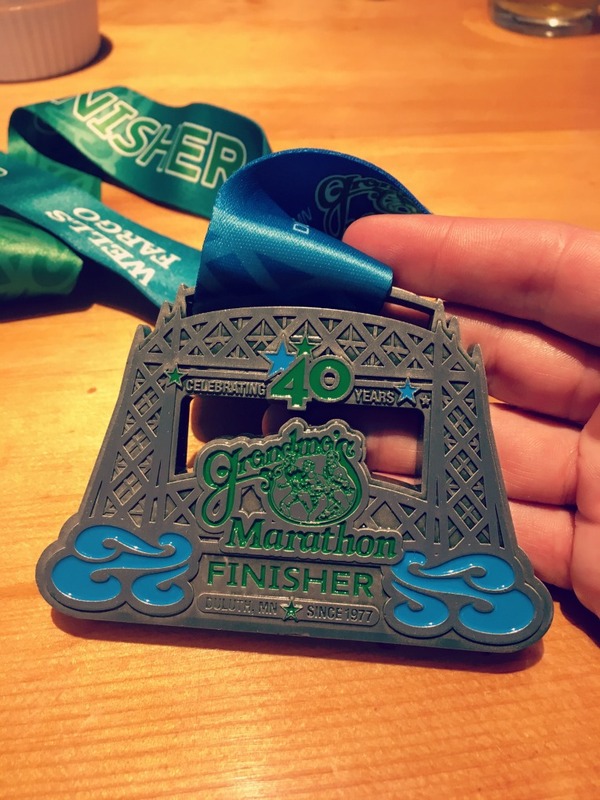 But then there’s a part of me that thinks that chasing this goal is crazy; I need to remember why I run marathons, which isn’t just for a certain time. I don’t run for this ONE goal of Boston, I run marathons because of the travel, for the chance to experience a city in this special way, I run them because I LOVE them; I love running. I have already run a marathon in Michigan. Why would I run this one- just for the goal of joining Dustin at Boston next April? 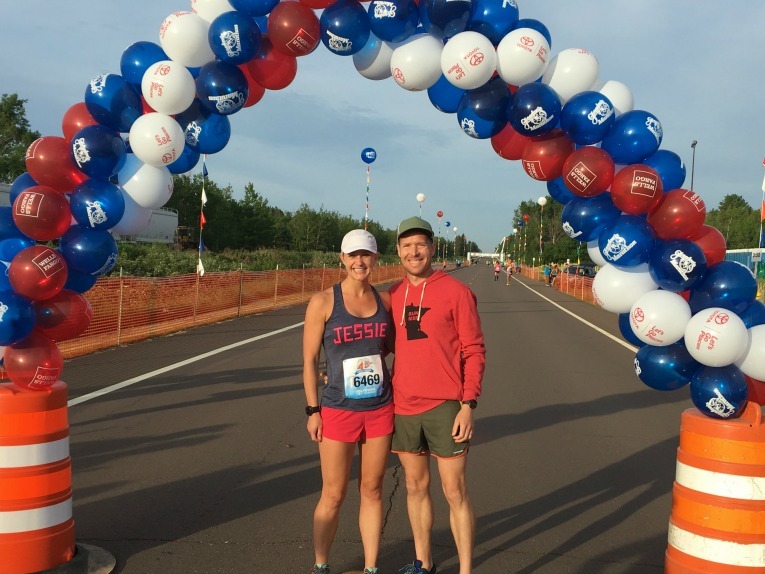 Would this race- and this goal- take away the positive reasons that I run? Do I want to be so focused on one goal that it loses its joy? These are some of things I am thinking about. I am confident that I was physically trained to run a 3:37. But I couldn’t do it in that heat. It wasn’t that long ago that I was still struggling to break four hours and now I can run 3:49 on a black flag kind of tough day. I am proud of how far I have come. Over the past five months, I ran a 3:39, 3:49, and 3:49; three marathons in a very short time. I’m grateful that my body (and mind) held up to the challenge. Boston will always be there. It’s not the end goal but rather just another chapter in this runner’s story, a chapter I’ll add to my story at some point. I look forward to many other chapters…and sharing them with you! 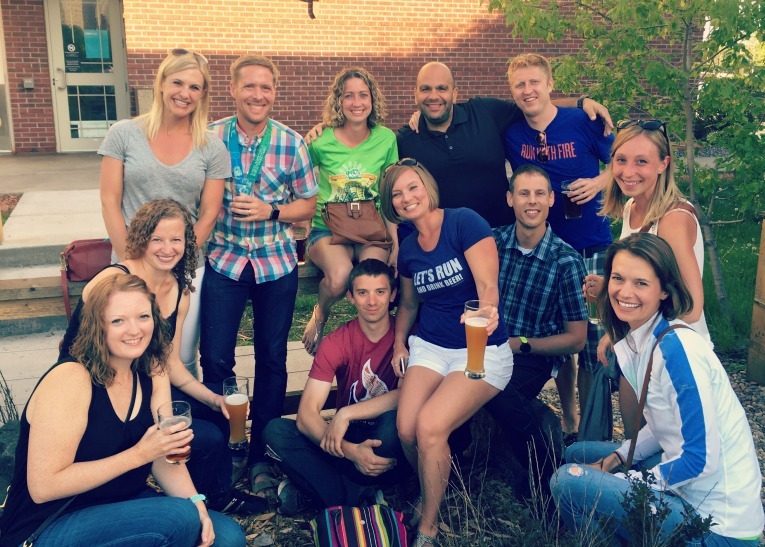 « Friday Five: My FIVE Favorite Places to Carbo-Load in Minneapolis! Omg I think I was running near you for a while! I remember the gray and pink, and I also remember people cheering for “Jessie.” I didn’t see your name on your tank top and I remember being confused how everyone knew your name. Lol. I only recently started reading your blog and forgot what your name was until I read your race review. Anyway, congrats on an awesome race! How did the race go for you? Tough day out there. Hehe, yes, I always go back and forth between naming you guys and calling you “running club friends.” 🙂 More than just running friends! It was nice keeping you guys in my sights for a bit but still running my own race, no pressure. I kind of did the same thing at Grandma’s last year! 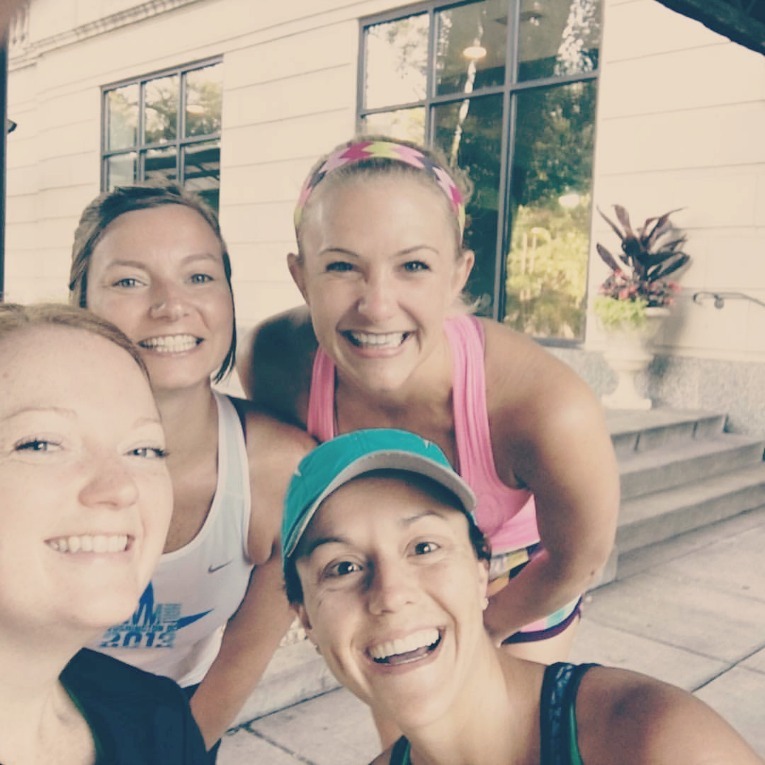 This is so true: “it’s the joy of sharing the training and experiences with friends, the accomplishment of crossing the finish line (with or without a PR or BQ), and the relationships I’ve built along the way.” <-- Agree 100%! We both trained our butts off and definitely can do it, just not on a black flag day! It was so fun chatting with out on the course! (Thanks for the shout out) :). It was a tough day out there for sure. I have no doubt you will get to Boston, especially with your positive attitude! It is all about enjoying the journey along the way and not losing the love for running! Great job!! And thank you for your comments, I am definitely taking some time to figure out what’s next and why. I will be in Boston next year, whether or not I’m running, so I will see you there! Yes! Let’s definitely get a run on the calendar…just give me a week to recover, haha! 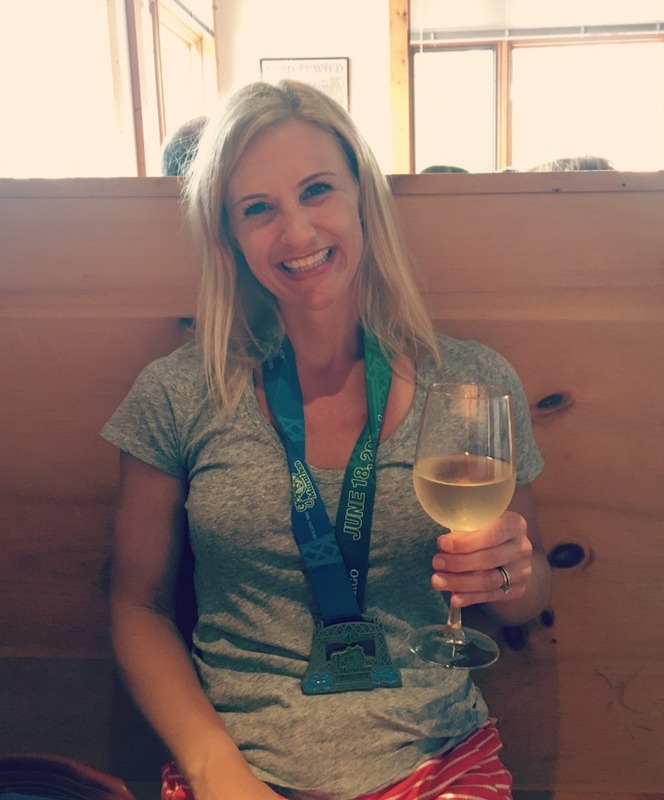 Congrats to you on an awesome half! Can I come, too?! I want to see you both! There was actually a booth for the Bozeman marathon at the Grandma’s expo and I grabbed a pamphlet just in case! Even if we don’t do it this year, we will probably run Bozeman at some point! If you decide to run a marathon in September, I’ve heard about this one (Big Cottonwood) through my previous running club in Florida. The course looks beautiful! Esther, this is one of the races my coach suggested! It looks gorgeous and its downhill. I have already run a marathon in Utah, but I’m definitely considering this one. Thanks! I think I was in that same bathroom line – I remember seeing a woman with a tank top with lettering running to the start corral from that section right near the driveway. I got into the corral about 2 minutes before the start myself. Congrats on getting the race knocked out. I had to revert to a Plan C race and just finish. I’m hopeful the weather gets back on track next year! Congrats on finishing Kristen! That might have been me…I was getting pretty worried in that bathroom line!!! You have such a great perspective, Jessie! It’s always about having FUN – whether you’re running for a BQ or not. 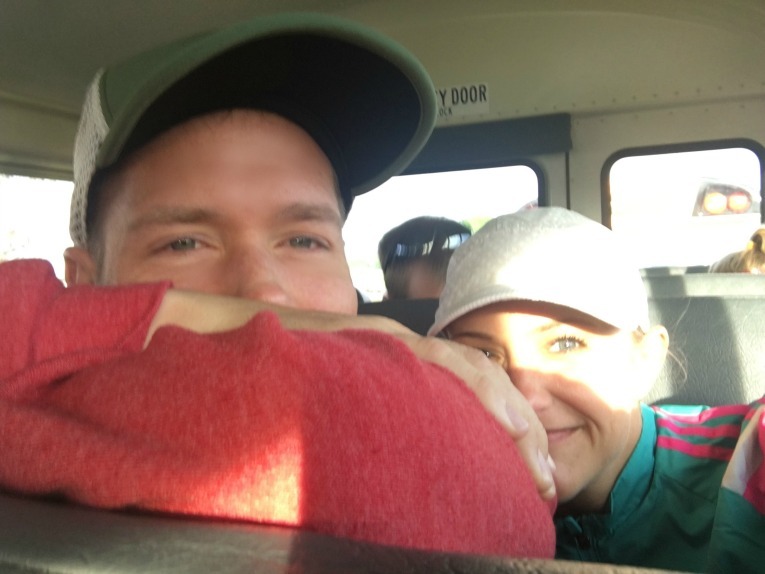 Keep having fun, and I have no doubt… Boston’s in your near future 🙂 Huge congrats to both of you on this 26.2! There’s nothing like Grandma’s. I was great to see you right after the race and again at the brewery! Glad we were able to catch up 🙂 Recover well! Let’s run soon! Great to see you and Nick too! Thank you very much Eric. I felt pretty tough in that heat…whew! You should definitely be grateful this wasn’t your year for Grandma’s. I bet next year will be better! Perhaps Honolulu marathon could be one of your destination marathons?? It’s not a bad course! Honolulu sounds like an awesome next marathon! I’m looking into it. we haven’t run one in Hawaii yet! You might be surprised at how “Japanese” the Honolulu marathon is- I felt like I was back in Japan at the expo! Everything was in both English and Japanese. The main sponsor is Japan Airlines so there are TONS of runners from Japan. I had no idea! It sounds like an awesome race. Well done Jessie. Running in the heat isn’t easy so that’s a great time in those conditions. It’s not always easy to decide what to do next, especially with a goal in mind, but it sounds like you’re weighing up your options really sensibly. Thanks Allison. I still haven’t decided. It’s weird not to know what’s next!